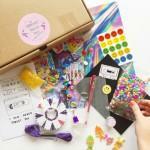 The Glittery Hands Box is a monthly box delivering a surprise of craft supplies to your door. Each month the box is themed, it could be anything from Mermaids to The 90's and is stuffed full of quality craft supplies to inspire you, allow you to try new crafts, get reacquainted with old ones or just add to your craft hoard. 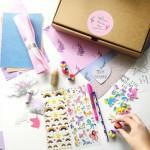 Each box contains at least 10 craft supplies from stamps and tools, to ribbon and stickers as well as hand mixed glitter and sequin mixes and 2 original illustrated papers. 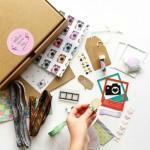 You can find inspiration inside the box in our monthly mini magazine or online on our blog. Be the first person to tell us what you think about The Glittery Hands Box and you'll save £2.50 on your next purchase! Boxes are posted on the 15th of each month. Subscriptions will close on the 1st of each month at 12 am for that month's box.